HUMAX is actively practicing sustainable management that embraces social responsibility, making certain these efforts yield the right results through ongoing interactions with our valued stakeholders. Since its founding, HUMAX has been steadfastly committed to sustainable management, joining the UN Global Compact in February 2015 and submitting our first Communication on Progress (COP) report in May 2016. 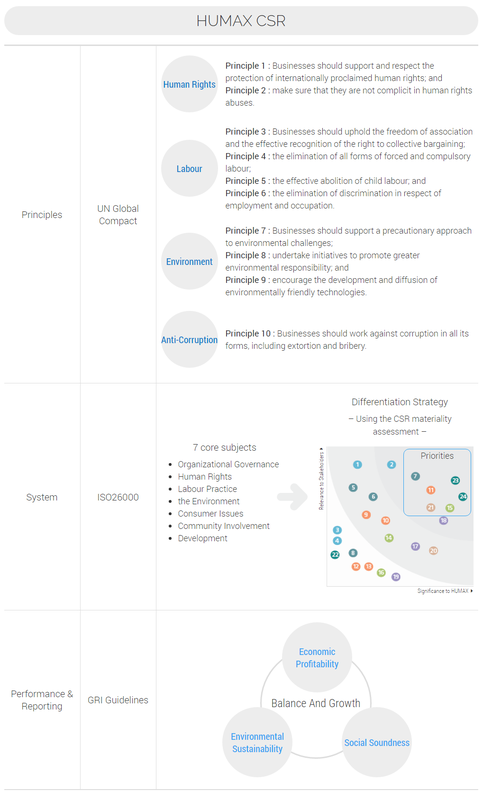 We fully support the UN Global Compact’s ten principles covering four major areas. In addition to our ongoing compliance efforts, we are committed to involving the entire value chain in our practices. HUMAX aims to be the world’s premier provider of content delivery systems and to contribute to the sustainable development for humanity. To this end, we strive to build trust with diverse stakeholders and to take leadership in the economy, environment and society for a balanced growth within the framework of the Triple Bottom Line (TBL). As a global enterprise, HUMAX’s responsible management involves the following ongoing practices. HUMAX is making every effort to build a sustainable management system that meets global standards and to ensure it is implemented company-wide. We aim to build and operate a total management system that is practiced by all managers and employees, not only by a handful of departments. We are also reorganizing and expanding our communication structure with our stakeholders to increase their participation, ultimately improving satisfaction levels and strengthening m utual trust. To combat climate change, HUMAX is fully committed to reducing negative effects on the environment and developing eco-friendly products. 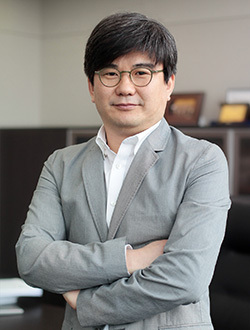 We have been voluntarily participating in the Carbon Disclosure Project (CDP), and in 2015 we became the first company in Korea to receive carbon footprint labeling on set-top boxes. Our environmental management activities go beyond merely complying with environmental regulations and expand into our supply chain to ensure sustainability for the next generation. HUMAX seeks to maintain a healthy relationship with all our business partners. We believe a partner’s competitiveness translates into our own competiveness, and a partner’s risk translates into our own risk. In 2015, joining the government’s “Growth Share Initiative,” HUMAX held a win-win partnership signing ceremony with our partners. We will continue our mutual-growth efforts with our business partners by improving communication, increasing their involvement, and strengthening activities that foster shared growth. HUMAX is intent on remaining a thriving business enterprise that continually creates value through sustainable management encompassing both economic and social values in today’s rapidly changing business environment. We look forward to your ongoing support as HUMAX continues its journey one step at a time toward becoming the global leader in its industry. 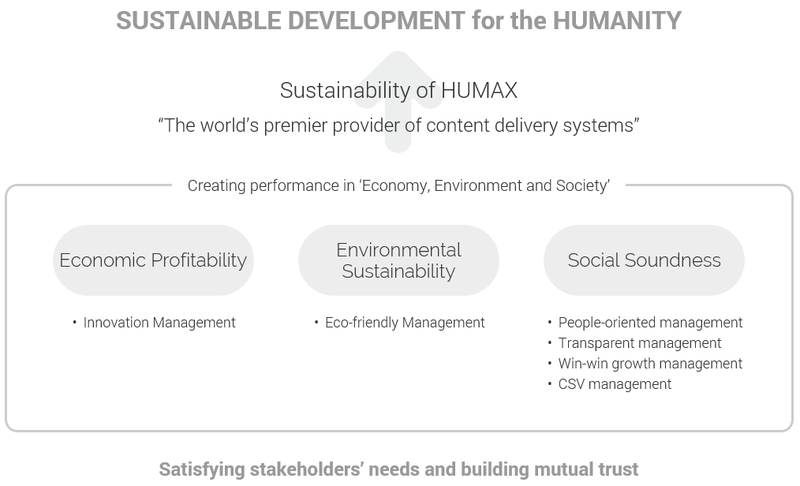 HUMAX aims to be the world’s premier provider of content delivery systems and to contribute to the sustainable development for humanity. To this end, we strive to build trust with diverse stakeholders and to take leadership in the economy, environment and society for a balanced growth within the framework of the Triple Bottom Line (TBL). HUMAX has developed a sustainability process based on global standards and is committed to producing results in the areas of economic, environmental and the community by focusing on the 7 core subjects. We have created a differentiation strategy by determining the needs of diverse stakeholders and focusing on the major issues related to sustainable management. Principle 2 : make sure that they are not complicit in human rights abuses. Principle 6 : the elimination of discrimination in respect of employment and occupation. Principle 9 : encourage the development and diffusion of environmentally friendly technologies. Principle 10 : Businesses should work against corruption in all its forms, including extortion and bribery. HUMAX pledges to fully disclose performance results from sustainable management practices to our stakeholders.